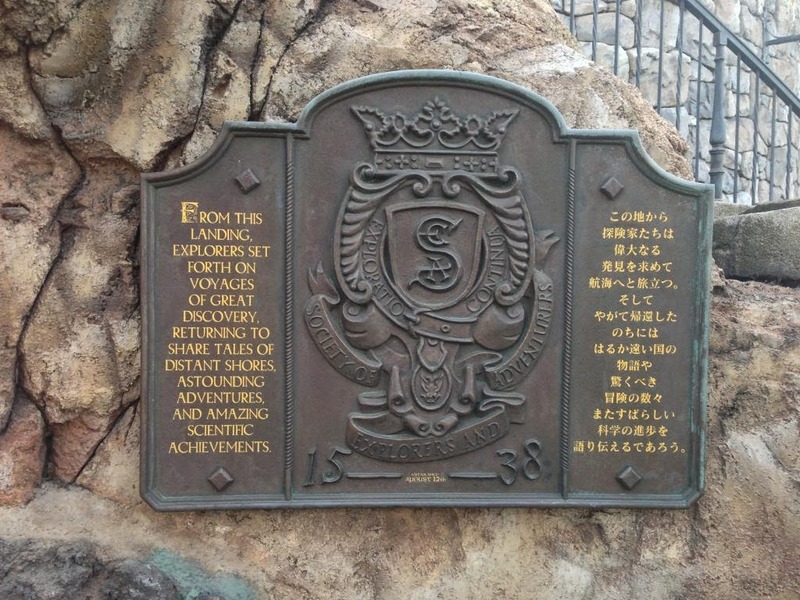 The Society of Explorers and Adventurers (S.E.A.) is certainly a widespread organization with daring adventurers both young and old. They seem to be found only in the most remote corners of the globe. And deep in the African jungle along a lazy river, not far from the Pangani forest, you can find another such intrepid man, Sir Roland F. Fairbanks. A jovial old soul who loves a good story, Sir Fairbanks has long given up his position as curator of the Museum of the Weird to undertake a search for a legend, a monster, a deity. He now lives deep in the jungle along a lazy river in the heart of the Congo. Fairbanks spent a great deal of time exploring the world for unique and often bizarre artifacts, some of which he still houses in his humble home, but most have found there way into the halls of his beloved museum. One such artifact was an ancient wooden statue of a snake-like creature with the head of a nasty looking fish, the river dragon, Nyaminyami. Sir Fairbanks found this rather unimportant looking statue not far from where he now lives and still keeps in a place of honor there. But, after researching the item, he learned just what the Nyaminyami was. But for the explorer, the search began in earnest after he had vivid dreams of the beast. So what did Fairbanks discover? 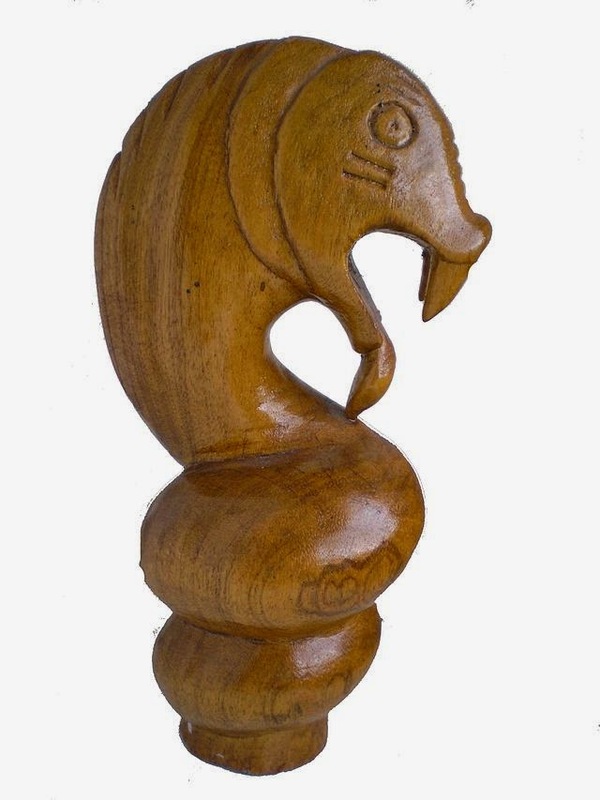 The Nyaminyami is a god to the Tonga people, a river dragon. The protector of the powerful Zambezi river and along with his wife ruler of the Underworld. It can appear as a dragon,a gigantic snake with a fish head, or even a deadly whirlpool. But even this potent monster was humbled by the advances of science. More specifically, the Kariba Dam which spans the Kariba Gorge where the god once lived. He who once controlled life around the Zambezi and even the river itself was chased from his home. The river dragon was humbled, displaced, and now angered. And waiting in the forgotten waterways deep in the jungle. Sir Fairbanks, quit his role as curator, and has tracked the monster to a little distant tributary of the Zambezi not too far from the town of Harambe. He is convinced the creature is somewhere in this river. And anyone who would like to help find it, is more than welcome to try. The home is nothing dramatic, nothing like the great mansion of Lord Mystic or even the glorious hotel of Harrison Hightower III. Sir Fairbanks has just a humble abode with a bunch of artifacts and his small pet, an African Golden cat, Chip. Guests will enter through the front door seeing all of these artifacts as well as paintings of Sir Fairbanks and his furry companion. Many of these artifacts are related to the search for Nyaminyami. These include maps, coins, carvings, pendants and the like. Before entering the boats to help the search, guests will see the statue that Sir Fairbanks uncovered years ago as well as a beautiful walking stick given to him by the Tonga people as as sign of respect for the old explorer and his mission. 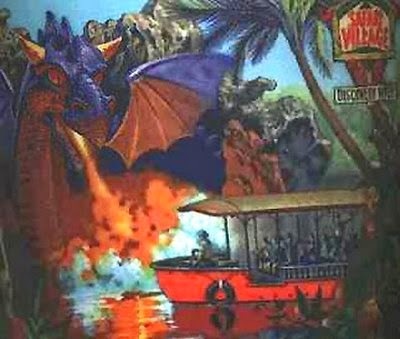 After boarding a boat, guests drift lazily down the river in search of the dragon. Along the bank, you will see Sir Fairbanks (get it?) and Chip in search of the beast. Shortly thereafter, you pass a small village that looks not only abandoned but somewhat destroyed. At that moment, there is some movement in the water and you feel a distinct bump. Some brief glimpses of shadows and odd noises in the forest keep you on edge. The forest keeps getting darker and the sounds once prevalent are now gone. Completely. It is then you see a large snake-like body breach the water briefly with a large splash. And another bump. This one a lot rougher than the last. The pace of the boat picks up as you feel river flowing faster until you see the falls in front of you. Then the dragon's back can be seen cutting through the murky water heading towards you. The creature begins to break the surface just as your vessel plunges down over the falls. But this is not just an ordinary flume. After plunging down, you rise back up and then back down again, hitting a steep bank - like a whirlpool. Gently slowing you pass a shocked and contented Sir Fairbanks, as he has finally found his prize. I love the idea of linking the Animal Kingdom with the story of S.E.A. Currently, there are two attractions across two different resorts that feature this fictitious group of explorers- Tokyo DisneySea and its Tower of Terror, and Hong Kong Disneyland's Mystic Point. And, the theme behind them is a perfect match for the Animal Kingdom. The themes of exploration and discovery, and man's venturing into the "heart of darkness" fit very well. Plus, a little nod to old school Disney, like the Museum of the Weird, would just add to the fun. And there is plenty of room in this park for just such an adventure. This would be so amazing. Great job Mike! It's Time for Another Jenn Greene Contest!